At present the Library has access to 9 collections from Archives Unbound, primarily covering topics and events from the twentieth century with one exception. Descriptions of these collections comes from the Archives Unbound site. From the National Archives the documents in this collection capture the hidden history of Europe during the Second World War and offer you new perspectives on politics, diplomacy and everyday life in the German-occupied countries. The documents come from the FO 371 files from the British Foreign Office and include detailed information from the occupied states of Belgium, Denmark, France, Italy, Luxembourg, the Netherlands, Norway and the Vatican, and the neutral countries—Portugal, Spain, Sweden and Switzerland. Although most of the collections we have access to via Archives Unbound cover the twentieth century, Global Missions and Theology covers the nineteenth century. The collection documents the broad range of religious missionary activities, practices and thought in the United States by reproducing pivotal personal narratives, organizational records, and biographies of the essential leaders, simple missionaries, and churches. The collection includes materials on missionary activities among Native Americans and African Americans but also activities further afield in places such as Africa, Fiji and Sandwich Islands, India, China, Southeast Asia, Japan, and Hawaii. From the John F. Kennedy Presidential Library and Museum this collection provides insights into President Kennedy’s views on foreign affairs, U.S. leadership of the “West,” and various worldwide crises. The collection contains files on a variety of subjects such as: Alliance for Progress, civil defence, foreign aid, hijacking incidents, nuclear weapons, policy planning, and space activities. 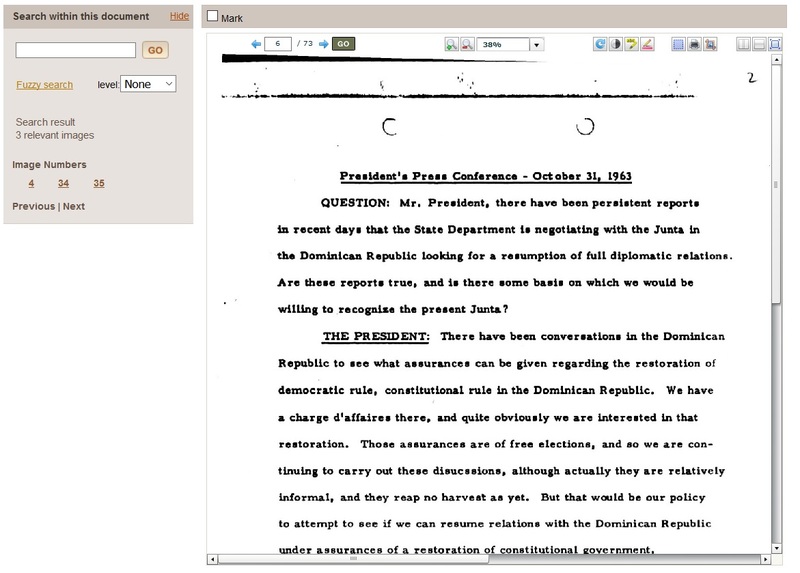 [Screenshot showing] Department Of State: Subjects, Recognition Of Foreign Governments, Public Statements On The Recognition Problem. N.d. JFK and Foreign Affairs, Part 1: National Security Files, Section 3: Departments & Agencies File. John F. Kennedy Presidential Library. Archives Unbound. Web. 9 Dec. 2016. La Guerra Civil Española collection presents approximately 3,000 rare pamphlets from the period 1936 to 1939, including publications from Spain, Portugal, Latin America and the Philippines, as well as more than 100 German pamphlets published in Spanish. Distributed throughout Spain, Germany, Italy, the Soviet Union and North America, these pamphlets represent the opinions and philosophies of the insurgents, anarchists, socialists and communists. This collection is from Special Collections & Archives at the University of California Library, San Diego. Covering the period 1946-1977 this collection contains materials on Santo Trafficante, Jr., Meyer Lansky, and Lucky Luciano. The collection includes FBI surveillance and informant reports; Justice Department memoranda, correspondence, and analyses; newsclippings and articles; Domestic Intelligence Section reports; transcriptions of wiretaps, typewriter tapes, and coded messages. This collection provides the widest range of original source material from the British Foreign Office, Colonial Office, War Office and Cabinet Papers from the 1917 Balfour Declaration through to the Black September war of 1970-1. Some of the topics covered include the British capture of Jerusalem, the milestones in the Palestine-Zionist tension and their impact on British policy leading to the Partition of 1948, Jewish terror groups, the background to the establishment of the State of Israel as a Jewish national home, the Border wars of the 1950s, formation of the United Arab Republic, the Cold War in the Middle East and Black September. This is our most recent purchase from Archives Unbound and this collection contains political papers documenting Chamberlain’s policies as Chancellor of the Exchequer and Prime Minister and highlighting his personal correspondence with his family. Find out more in a previous blog post New to the Library: Papers of Neville Chamberlain. [Screenshot showing] Gifts Received after the Munich Crisis. Correspondence. 1938-39. (Letters 29-77). 1938-39. 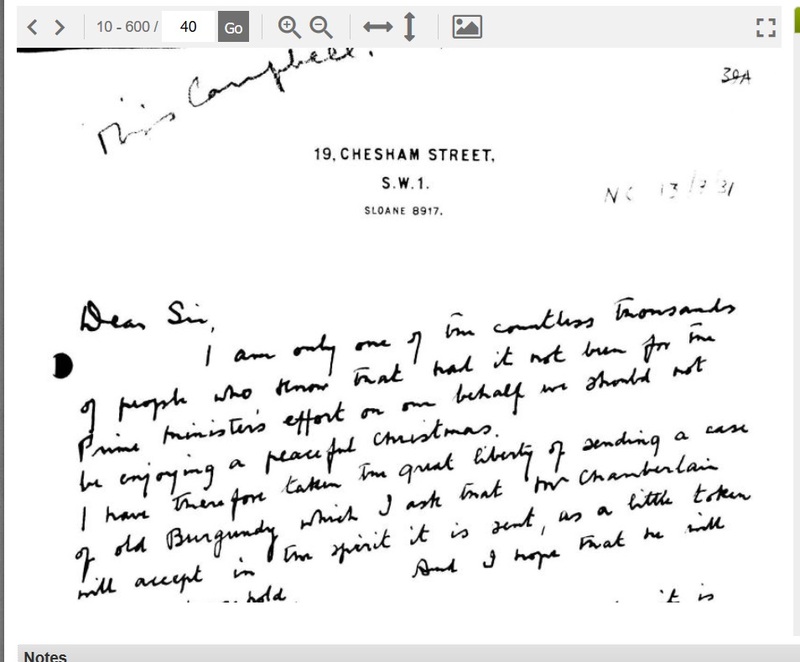 MS Papers of Neville Chamberlain: Chamberlain Papers, Series One: The Papers of Neville Chamberlain. University of Birmingham Library. Archives Unbound. Web. 9 Dec. 2016. The primary source materials in this collection represent a large portion of the archives of the British-run municipal police force based in Shanghai’s former International Settlement. The documents give you the opportunity to explore a unique period in China’s struggle toward a modern existence through the International Settlement in Shanghai. The First World War had a revolutionary and permanent impact on the personal, social and professional lives of all women. Their essential contribution to the war in Europe is fully documented in this definitive collection of primary source materials brought together in the Imperial War Museum, London. The collection is made up of unique documents, many of which have never been available online before, including charity and international relief reports, pamphlets, photographs, press cuttings, magazines, posters, correspondence, minutes, records, diaries, memoranda, statistics, circulars, regulations and invitations. All of these collections can be accessed via the Databases A-Z list or on the History and other relevant subject database pages. Find the previous Spotlight on… at Spotlight on Digital National Security Archive (DNSA). This entry was posted in Library, Online resource, Primary sources, Spotlight on and tagged Databases, First World War, gender studies, History, International Relations, Politics, primary source, Spanish Civil War, Spotlight on, World War Two, WWI, WWII by cstirling. Bookmark the permalink.